I grew up in Illinois (2 hours of south of Chicago) but frequented the city/suburbs frequently. Most of my family lives in the Chicago area and so does my best friend. We try to visit as many times as we can but our time in the city neighborhoods are always cut short. We did manage to visit a few great spots this trip and are excited to browse Airbnb soon to find a place in a city neighborhood for spring. 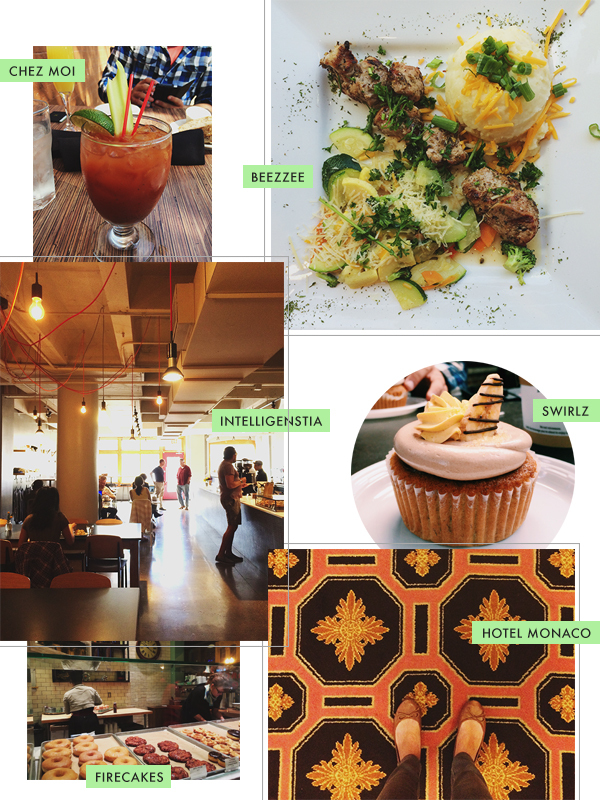 $5 Bloody Marys at Chez Moi, Meat and veggies at BeeZzee, the best vanilla latte at Intelligenstia, melt-in-your-mouth gluten-free cupcakes at Swirlz, a funky stay at Hotel Monaco, and a donut ice cream sandwich for Adam at Firecakes. We love spending time in new places but equally enjoyed seeing my family and friends. I was able to hug my grandpa, laugh with my sister and play with my best friend’s kids. My heart is full and now I’m home. Happy October! I loved this post. 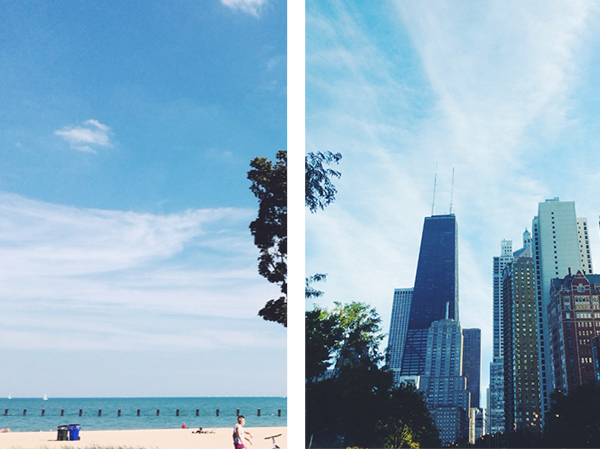 Chicago is probably my favorite city in the US and I am so excited to go in February. I’m glad you had a great time and that you were able to see friends and family. That’s the absolute best. It is easy to stay where you’re hotel is…we stayed downtown and took us just saying we NEED to go outside of the area. Loved your post!! Swirlz and Intelligentsia are the BEST. If you do Airbnb, try looking in Wicker Park or Roscoe Village. Both are really great areas with lots of shops and restaurants. I’m glad you approve!! And thanks for the recs for our next visit. We only got a full day to explore so we’re itching to return already! Maybe we can get a coffee at Intelligentsia next time? I love the way you collaged those photos! So tough to do a good roundup of many travel photos without overwhelming the site. Thanks Rachael!! It was fun to experiment with. I’ve been getting tired of my normal stacked, full-width approach. Chicago was the first place I traveled to by plane, and is probably my favourite city! I am definitely going to check out the places you mentioned above next time I am there!! YAY! So glad. Let me know how you like them and if you find any good ones.